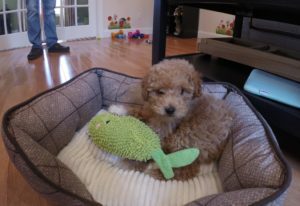 Bernie is an 8 week old Mini Poodle Mix, whose owners understood the importance of proper training. That’s why they contacted me for Puppy Training in Purdys NY, even before they acquired Bernie. His owners preemptively scheduled our training prior to his arrival. 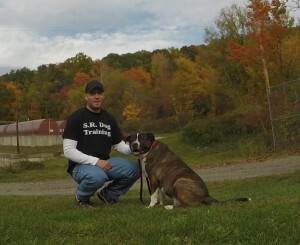 We started Bernie’s Puppy Training in Purdy’s NY within 48 hours of him arriving home. The topics we cover in our first session of puppy training are: My very successful Housebreaking protocol, how to properly handle puppy biting, crate training, and what the typical day/routine should look like for your new puppy. Once we got Bernie’s family on the right track with those aspects of puppyhood, we transitioned to beginner obedience training and how to best properly introduce him to their two existing cats. Even though Bernie is going to be a smaller adult dog, it is still essential that he understand basic obedience commands, such as: “Come”, “Sit”, “Down”, and “Stay”. These are just a few of the 5 Obedience Commands to Make Your Life Easier. Some people think it’s better to delay puppy training until the dog is older, but that is the farthest thing from the truth. Puppies are just like little children, in the sense that they are constantly learning and taking-in the world around them. For that reason, it’s important to make sure you are teaching your new puppy the correct things from the start. I work with dog training clients every day, who are struggling with behavior issues in their adult dog, which could have easily been prevented when they were a puppy. By teaching your puppy to go to the bathroom outside, not pull you down the road on walks, and not to jump on guests who visit, you are well on your way to preventing the most common behavior problems that face adult dog owners. Bust is an incredibly happy, cute and playful puppy with an amazing family! 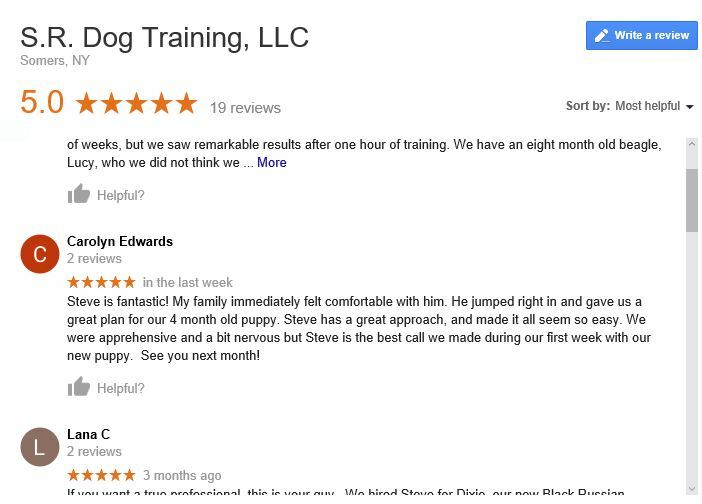 After just our first training session, I received this amazing Google Review from his owner. We cover many subject in our initial puppy training session, which include: housebreaking, crate training, how to handle puppy biting and mouthing, and how to teach your puppy their name.